Jay Appurao, MD, FACS is the leading provider of the QuickLift® Facelift procedure in the Lafayette, Louisiana area. Dr. Jay Appurao is board certified by the American Board of Surgery, a fellow of the American College of Surgeons and a member of the American Academy of Cosmetic Surgery and the American Academy of Cosmetic Breast Surgery. 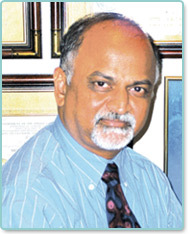 Dr. Appurao earned his medical degree from Kasturba Medical College in Manipal, India. He furthered his medical training by completing his internship at Lutheran Medical Center in Brooklyn, NY and his residency, including Chief Residency at The Bronx Lebanon Hospital Center, Bronx, NY. Prior to coming to Lafayette, he further expanded his cosmetic surgery skills by training with leading board certified cosmetic surgeon, Dr. Robert Yoho in Pasadena, California. Affectionately known as Dr. Jay to his patients and colleagues, he is dedicated to providing the best possible care with a skilled hand and personal approach to his patients. Over the years, the Lafayette, Louisiana cosmetic surgeon has acquired excellent skills from hands on training with anti aging experts in the fields of facial cosmetic surgery, laser liposuction, tummy tucks, breast augmentation, and cosmetic surgery after severe weight loss. In addition, Dr. Appurao has received extensive training in the QuickLift® mini facelift procedure as well as other face lift procedures.